Taylor is campaigning with Nathan Estruth for the Republican Primary for Governor of Ohio. Their current competition is Mike DeWine and Jon Husted, whose ticket has the endorsement from the Preble County Central Committee. Taylor pleaded her case to a crowd of approximately 19 Preble County voters, where she explained her voter history and how she compares to DeWine. Lieutenant Governor Mary Taylor stopped by 1808 Cafe in Eaton on Friday, April 6. There she talked to Preble County voters, to convince them that she should have their vote come Tuesday, May 8. EATON — Lieutenant Governor Mary Taylor stopped by 1808 Cafe in Eaton on Friday, April 6, for a meet-and-greet with Preble County voters. Taylor is campaigning with Nathan Estruth in the Republican Primary for governor of Ohio. Her current competition is Mike DeWine and Jon Husted, whose ticket has the endorsement from the Preble County Central Committee. Taylor hosted the event in Eaton with the intention of getting to know Preble County voters and convincing them she should have their vote in May. Voters will decide which ticket they want to run for governor on Tuesday, May 8. The winners of the primary election will face either Richard Cordray or Dennis Kucinich in November. Taylor pleaded her case to a crowd of approximately 19 Preble County voters, where she explained her voter history and how she compares to DeWine and Husted. “We are doing these meet-and-greets all over the State of Ohio and we really appreciate you coming out to get a full understanding of what your choice is for this May primary,” she said. “I have no problem making it unmistakably clear where I stand on the issues that matter to the people. That is who I am. I will tell you though, I am a little worried about our Republican Party and I am especially worried about our Republican Party in Columbus. From Akron, Taylor was raised by her single father, who was a brick layer. She said she got her work ethic and drive from watching her father work hard, despite his disability he acquired after having polio as a baby. She was the first from her family to graduate from college, when she received her degree in accounting from the University of Akron. She started her private sector career after graduation. When her first son was born, she balanced her career with being a devoted and loving mother. She worked a part-time schedule so she could do both. “Women followed behind me and were able to do the same thing,” she noted. She spent 16 years working in the private sector as a CPA. She got involved in politics due to a local property rights issue. She started at city council and then ran for the state legislature to become a state representative. According to Taylor, she won the first legislative race in a “deeply blue district.” She was also the only Republican to win statewide in 2006, a landslide Democrat election year. She became state auditor that year. 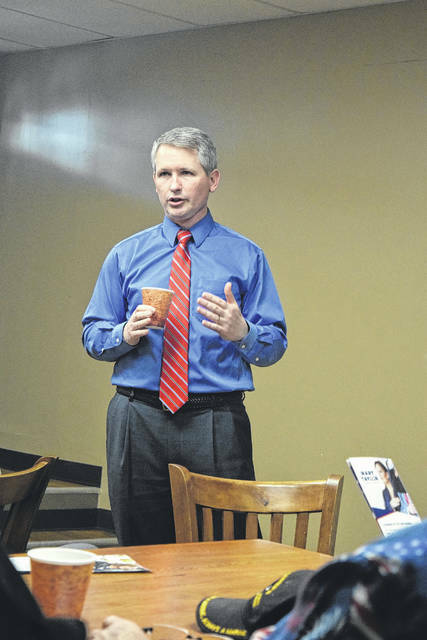 “As your state auditor, I did what I said I was going to do. I held government accountable for the tax dollars it spends. I understand the importance of protecting those tax dollars. I was proud to be called a watch dog of the Treasury,” she said. “As your governor, I will end the Medicaid expansion. I have said from the beginning that it is not sustainable and it is not the best we can do.,” Taylor said. “The vast majority of individuals in that population are able bodied adults. Our efforts should be on getting those individuals back to work. I will end common core curriculum, once and for all, restoring local control to our parents and communities to design a curriculum that best meets the needs of our students. She added, she is a strong defender of the Second Amendment and is a concealed carry license holder herself. Her running mate, Nathan Estruth, is from the private sector. According to Taylor, she wanted someone from the private sector who was also a dedicated conservative. Estruth has more than 26 years of experience at Procter & Gamble, including global multi-national companies, venture and private equity backed high growth companies, large and small retailers, franchising, health care service and diagnostic companies, and several start-ups. He earned a bachelor’s degree in Political Science International Relations from UCLA and spent an additional year of graduate study at the John F. Kennedy School of Government at Harvard University before joining P&G. https://www.registerherald.com/wp-content/uploads/sites/41/2018/04/web1_Mary1.jpgTaylor is campaigning with Nathan Estruth for the Republican Primary for Governor of Ohio. Their current competition is Mike DeWine and Jon Husted, whose ticket has the endorsement from the Preble County Central Committee. 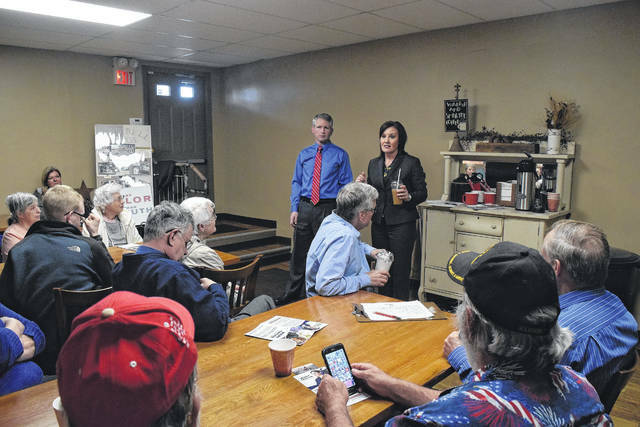 https://www.registerherald.com/wp-content/uploads/sites/41/2018/04/web1_Mary2.jpgTaylor pleaded her case to a crowd of approximately 19 Preble County voters, where she explained her voter history and how she compares to DeWine. 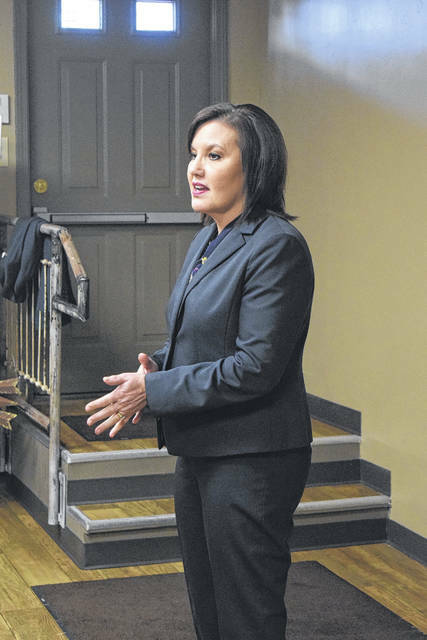 https://www.registerherald.com/wp-content/uploads/sites/41/2018/04/web1_Mary3.jpgLieutenant Governor Mary Taylor stopped by 1808 Cafe in Eaton on Friday, April 6. There she talked to Preble County voters, to convince them that she should have their vote come Tuesday, May 8.